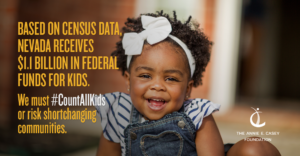 When young children are missed in the census, our children, families and communities can suffer long lasting consequences. With the 2020 census fast approaching, it is time to make sure we count all our children! How is the Census data used? programs that help children learn while their parents work, by helping pay for quality child care. States, localities and businesses use census data to plan, including where to put new schools or to open new stores. Want to know more about what will happen in 2020 and what you can do? visit the www.countallkids.org to learn more!